If you feel youd benefit from a more personal, made-to-measure class - then why not contact us for a private lesson. We can work with you on your own or with you and a partner. Maybe you need an intense crash course in the basics - maybe you want to learn a routine for your wedding day first dance - maybe youd just like to brush up on your style or improve your lead or follow. As well as Lindy Hop, we can help you with all the related swing/jazz dances from the Charleston - Collegiate Shag - Balboa etc through to Blues and breakaway swing steps. In fact any combination of swing, motion, dance and technique that you require. We can travel to your place if you wish but have our own studio in Bath. 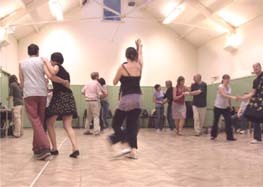 Swing - motion - lead & follow - styling - routines - different dances - whatever you require in swing dance we can help you. The Private lessons are not just for total beginners, you can book in up to advanced level. We have a dance space that can incorporate up to four pupils - any more than this and we can hire a hall or come and teach at your venue. If you have a small group who is interested in learning some Lindy Hop or possibly Charleston or Balboa and you have access to a hall, get in touch with us and we can arrange personalised classes to give you exactly what you want and tailored to your level. Group sessions work out much cheaper per person than one to one private lessons. Blocks of classes - say a block of four sessions - work out cheaper per class. Sessions longer than one hour work out cheaper per hour. Aimed at total beginners and those who wish to recap the basics. Over each term these classes will cover the basic 6-beat, 8-beat and Charleston rhythms and shapes as well as style, lead & follow and basic break steps. A natural progression from beginners, using all previously taught basics and building on them. More eight beat shapes, plus adding variations, 'flash' steps and footwork. Stronger emphasis on style and lead & follow. 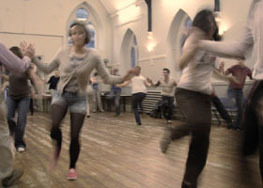 A progression from the previous levels - it would be assumed that dancers would be able to social dance Lindy at this level. As a guide, a knowledge of 6-beat, 8-beat and Charleston rhythms, Swingouts, Lindy turn, Lindy circle and Back Charleston are assumed. Strong emphasis on lead & follow and style. More complicated rhythms and timings with some syncopation. Occasional special classes. An understanding of lead & follow as well as an ability to move freely between 6-beat, 8-beat and Charleston, using any combination of single, double and triple time, is essential. For all those comfortable with Intermediate classes. Very strong emphasis on style and detail rather than just figures or routines. No - we have a lot of people who come to the classes on their own. We frequently rotate partners every few minutes during the class, so all the leaders will dance with all the followers. This makes for a sociable class and also promotes faster learning. Casual clothes are fine - people tend not to dress up for classes. Wear something that's comfortable to move in. For ladies, a low or flat shoe (that won't come off) with a smooth sole that can slide /turn on the floor; for men something fairly lightweight and flat. Some like leather soles but this can be too slippy - others prefer a deck shoe style with a smooth rubber sole. CAN I JOIN ANY WEEK? Yes - we have new people join most weeks. The classes are run on a pay as you go basis, not as a course. We go over the basics at the start of each class, although as the term progresses, we may add some of the more complex beginner's moves/steps. We work roughly to school terms, with short breaks in between.